For nearly twenty five years, the complicated rivalry between figure skaters Tonya Harding and Nancy Kerrigan took the world by storm. In 1994, obsessed news outlets and the public tried to call the shots of how Harding attacked her fellow competitor to stay on top. Now, this time solely focusing on the former, I, Tonya ambitiously sets at least one side of the story straight. Tonya Harding (Margot Robbie) was raised by her ruthless, narcissistic mother LaVona (Allison Janney) to be the best figure skater in the world. Determined and hard-working, she manages to become a U.S. Champion on her way to Olympic glory. Then her abusive husband Jeff (Sebastian Stan) and his lame-brain friend Shawn (Paul Walter Hauser) clumsily attempt to out her biggest competitor Nancy Kerrigan by whacking her in the knee. The attack instigates a worldwide scandal spiraling Harding’s fall from grace. 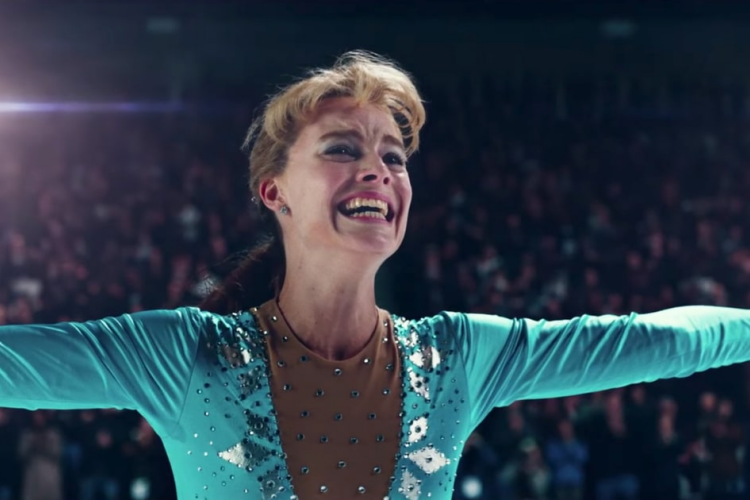 Taking a page out of Tonya’s book to be unpredictable and unvarnished, director Craig Gillespie’s film is not your typical biopic. More of a tell-all from Tonya and her family’s perspectives, the movie plays with different sides of the story because there never is just one. The movie is narrated by the four main culprits involved throughout Harding's life - Harding, LaVona, Jeff, and Shawn. As they describe their versions of events, history isn't concerned with looking back and over-fictionalizing what happened. Nope, this movie's all about letting the people directly involved have the final word. Through a wicked ride of comedy and drama, Harding is painted differently than how we might remember her. If one is looking for a catfight on ice, the movie is going to disappoint. Harding's life leading up to the incident and afterwards is depicted in a no-holds-barred, flipping her reputation as the victimizer against Kerrigan and showing her own experiences as a victim of domestic abuse. Delving into the normalized abuse Tonya suffered by her mother growing up, and then her husband, Robbie as Harding often breaks the fourth wall in the middle of being attacked or insulted, describing to those watching what's going on, how she feels and why the cycle continued. It's not the most typical or sensitive way to display what she went through growing up, but it's pivotal in showing how desensitized Harding had become to these normalized cycles and how big of a hit her self-worth ultimately takes. By pushing herself out of her dysfunctional family, Harding is a scrappy warrior. As the film dives into the absurd, letting you be a spectator to her downfall and addressing how the media portrayed her, its offbeat style also creates empathy for her; to understand the purpose of skating as her Achilles’ heel; how she gets her self-worth from skating, how her ambition is a refuge and curse. The movie is wildly successful in its ability to be heart-wrenching and uncommonly funny. But never it never entirely absolves Harding for what happened to Kerrigan, nor uses any of the film's violence for cheap laughs. What ultimately carries I, Tonya is the cast lead by Margot Robbie. Playing Harding from fifteen to forty-seven years old, the native Australian completely throws herself into the role from the mid-western speech to the second-hand make-up and costumes. As an actress, and a vital producer to the film and ensuring the movie was sensitive yet candid, Robbie creates a palpable image of Harding - a white-trash underdog who’s unvarnished personality didn’t fit the golden ice princess image. The film’s style has a lot going on, and Robbie manages to ground the audacious portrayal into something believeable. With her, the supporting cast Sebastian Stan, Allison Janney, and Paul Walter Hauser, morph what would be caricatures into real-life people that you really can't believe actually exist. A big hand goes to the screenwriter Steve Rogers in balancing Harding as both a victim and victimizer; she was a bystander to her husband’s crime and also complicit in it. The film covers a lot of ground like class in America, the value of a person’s image over their talent, and a woman determined to break free. His writing bends and curves all over the place but never jumps the tracks. Interestingly, as the movie focuses on Tonya more than Kerrigan, a lot of critics wonder what the latter thinks - especially since Harding serves as a producer and I, Tonya’s has been collecting accolades in Hollywood. It’s easy: she’s moved on and living her life. Even though the movie does not glorify and limits showing Kerrigan’s perspective, much of the social commentary about her comes across as a projection of long-overdue sympathy. Considering that the movie explores society's judgement on them both, it's interesting to look back and see them both treated like a sideshow in this major circus; Kerrigan also became a salacious scandal, soon not living up to critic's expectations, with her attack being made into parodies and getting called out her on her own mistreatment to other skaters. It makes me wonder if we’ve moved beyond a place in cinema to explore people who are flawed and don't live on an imaginary pedestal that everyone is perfect; or that maybe the expectation for the movie was to pit two women against each other in a superficial feud. I, Tonya is not a straight-forward investigation of ‘Who dun it’, trying to cleverly re-imagine who is the real culprit of attacking Kerrigan. The movie’s a true-crime soap opera, digging into a scandal that divided the world, the dark underground of figure skating, and a woman picking herself up from her bootstraps skates. The story swerves in-between being funny, dysfunctional, and dark, but as crazy as it gets, it never loses sight of Robbie as the star or the Harding as the story; it's pure gold. Have you seen I, Tonya? What did you think?